A honey cake with more than 60 meters was presented this afternoon at Rua da Carreira. The initiative is in its fifth edition and part of the Parish Council of São Pedro. Inauguration was the mayor of Funchal, Paulo Cafôfo and the leader of the local parish, António Gomes. The extension of the honey cake is a new record, registering 61 meters and a half, spread over more than 150 pieces. The confection was in charge of the Socipamo pastry, also counting on the collaboration of the Ribeiro Seco Honey Factory. 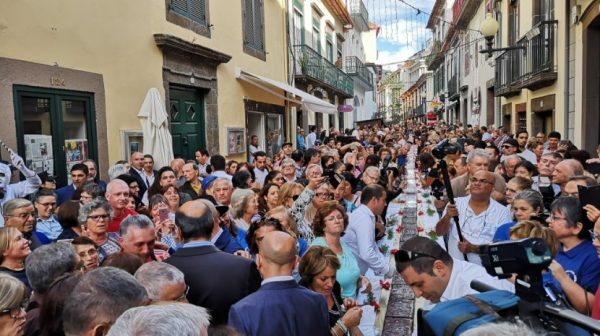 To help in the tasting of the cake, there was also Madeira Wine at the disposal of those who went through Rua da Carreira or was going to pass. The event had a procession before the cut of the cake, counting also with animation until the 23 hours. The good disposition and the affluence of the people are testimonies of the success of the event.